I've struggled a bit the past couple of days on whether I'd write anything related to the September 11th tragedy that occurred fourteen years ago today. It's a moment in time that I still find difficult to put into words, and I don't really have the capacity to appropriately convey my thoughts and emotions. I can't really explain why. I didn't lose a family member that day, nor a friend or acquaintance. Certainly, I was far removed from any direct relationship to those events. Still, I feel a great loss and I suspect many of you are in the same boat as myself. I dunno. This is a day I don't like to think about. 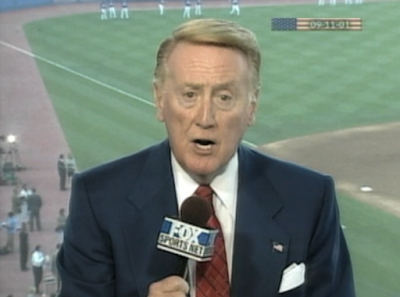 But then I was pointed to a video (via Reddit) featuring Vin Scully talking about it all, and suddenly I realized I should at least share it here. Feel free to take a moment to let Vin put you at ease. Below are two separate videos to watch. The first video is from the Dodgers first home game following the tragedy on 9/17/2001. This next video is from the ten year anniversary, on September 11, 2011.